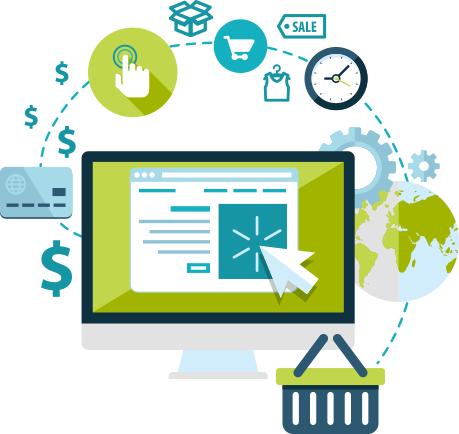 E-commerce or Electronic Commerce involves purchasing and selling of goods or services, as well as transmitting funds or data, through an electronic network, most often the Internet. These transactions can occur in four methods, namely business to consumer, consumer to business, consumer to consumer or business to business. As an online business provider it is extremely important that your company invests in a sound shopping cart software for your website. Through Aclatic we will enable you to create a customized, easy to use website that will bring profit to your doorstep while ensuring your customers are well satisfied with reliable payment gateway facilities. Online shopping that allows customers to pick & choose products for a virtual ‘trolley’ is known as the ‘shopping cart system’. Online marketing too involves a POS (Point-of-Sale) system, at this point the retailer calculates the amount owed by the customer and provides options on how the due payment can be made. Many companies provide customers with online ordering systems, allowing their clients the luxury of selecting & ordering goods and services from the comfort of their homes increasing their popularity in the market. Online payment systems or E-commerce systems allow customers to purchase products by making electronic payments online via credit cards, debit cards or other similar methods. This increases the convenience & guarantees payment for goods bought online. E-commerce business is constantly evolving but what matters is speed and customer orientation. We demonstrate our clients by delivering end-to-end E-Commerce solutions that include online shopping development, payment services, and E-Commerce consulting.